[DIFFERENT]: 3000K WARM SMD LED TECHNOLOGY. Most suitable light color temperature for eye-care reading. 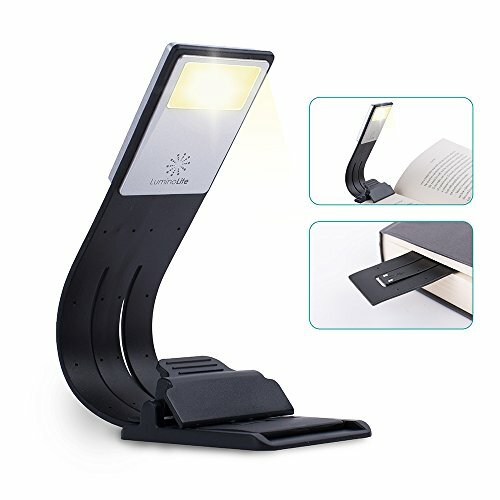 LuminoLite is the FIRST and ONLY brand to introduce bookmark book lights with THREE UNIQUE UPGRADES: (1) 3000K warm LED, not 7000K bluish blinding light. (2) Enhanced Brightness from 12 lumens to 28 lumens. (3) 30% Extra-large capacity rechargeable battery. LuminoLite present you the best reading experience. TAKE IT EVERYWHERE. When you are traveling, take this book light on plane for your kindle and books. It is small and handy enough to take anywhere. FEATURES BUILT-IN USB CABLE, it's convenient without extra cable. Our bookmark book lights can be made flat and act as a bookmark. 1.5 oz lightweight, so it doesn't add much weight to the book you're holding up. Soft rubber coated bendable metal neck allows you to position the light direction. With a clip is strong and stays in place. It looks cool.